This is a good device if you live in a soft water area. However if you are in a hard water area like us,(West Essex, UK), the device has a limited life. In order to maintain its performance it will require regular descaling, possibly bi-monthly, to get rid of limescale build up. Even with that frequency it is likely to suffer damage that will result in coffee and/ or hot water escaping from around the pod retainer and spilling onto the work surface.. A descaling kit is available from the manufacturer. Friends elsewhere in the UK,(Sussex) have experienced the same issue. In their case a replacement machine was acquired but also suffered the same problem. If I am anything, I am an avid coffee drinker. Since I have a love for it I was especially amused when I received it as a gift. I love the shape and design. It was the first time I ever seen a circular globe shape on a coffee maker. Mine is black although, I later discovered that they come in red as well. I like mine because black easily meshes with pretty much anything. It was pretty easy to put it together and it is a breeze to clean as well. Some parts are detachable so it makes the cleaning a breeze. The real pleasure in this machine though, is the quality of the coffee itself. 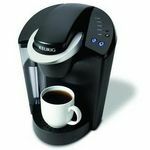 It brews a perfect cup quickly and almost effortlessly and a wonderful freshly brewed scent lingers throughout my home. 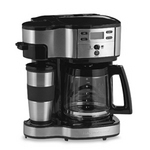 It has a pressurized system that makes the coffee taste more like an actual coffee house. More good news is that it comes with a 12 pack of assorted coffee capsules. The coffee is just as great as the actual machine. Getting free capsules really sweetened the deal for me. This is simply an excellent coffee maker that has yet to leave me disappointed. I enjoy sharing a fresh brewed cup with friends when the come by and they always get a kick out of it's strange shape as well. It is as if the shape has taken on a life of it's own and become quite a bit novel. Brew Performance Brews a nice cup pretty quickly. Design It's shape really amuses me. I love the fact that one machine does hot and cold coffee and gives me the flexibility to make strong and weak coffee depending on what my guests like and this machine does that in a very nice and compact, yet stylish form! Brew Performance I can make a strong espresso and a weak latte with plenty of steamed milk right out of the capsule. I really appreciate the convenience to make steamed milk out of a capsule rather than rely on my old milk frother to make the perfect latte. Ease of Use Love the fact that we can make hot and cold coffee by just popping a couple of capsules and then we can have latte too. All you need are one or two capsules (if you need milk with the coffee you just use a second milk capsule from the package) and then set the lever to determine how much water you want to run through the capsule. Design looks stylish and works. If nothing else, the little machine that could make customized coffee is also a great attention getter in the kitchen because of its unique design. Durability I have had the machine for 2 years and it is still going strong - great quality! 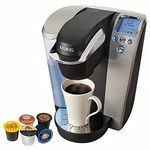 This machine is top of the line and works great, but the coffee pods are more expensive than most and there is no way to use a Eco-friendly version of the pods. I would recommend this to the coffee shop frequenter wanting to save money on Starbucks visits, but for the everyday cup of joe drinker or coffee connesseur, it may be more bells and whistles than quality. Krups has done it again! This summer when my family traveled to our home country of Portugal, we were looking for a new all-in-one coffee and espresso maker. We went to our local store and came across the Krups Nescafe Dolce Gusto Machine. We hot to sample all the coffee, espresso, hot chocotate and iced drinks. We were in love and bought one for our apartment. In Europe we constantly make espresso at all times of the day, so this easy to make machine made gourment european espresso at a fraction of the time. Then when we got back to the US, my father, my sister and myself all got one of the machines for each of our homes. I currently still have my Krups Espresso machine and i'm not getting rid of it, but I love the convenience for small gatherings. We love entertaining and with this machine it cuts the time in half. We especially love that the water boils in seconds and the wait time from when you plug the machine and make your coffee is probably less than 1min. The only thing is you have to constatly buy capsules, but it sure beats spending money on take-out coffees. My husband and I go through spurts where we will drink a ton of coffee and then none at all. As a result, we often bought cans of coffee only for them to go bad before we could finish. This coffee maker was a perfect solution for us. It's easy to use and looks great on my counter. 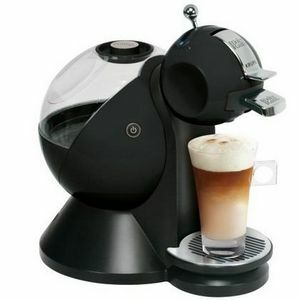 It also takes up less real estate comparred to our previous traditional style coffee maker. There's a variety of capsules to choose from. However, I wish Nestle would incorporate a wider variety of teas to the line. This coffee machine makes a great cup of coffee, and you can personalize it to the strength that you like. 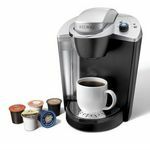 I had a coffee party the other day, and I featured this coffee machine, and I bought a lot of different pods of the coffee. Everyone was just amazed at how easy and fast it was to make a cup of coffee, as strong as they like. I even made the non-coffee drinker in the home, into a coffee drinker. He asks me every night, if he can make a cup of coffee with it. 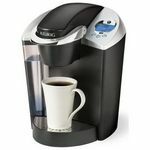 Once again I like the single-serve aspect of this coffee maker, it is fun, and much cheaper than going out for coffee. The only drawback if anything, is that the capsules are not available in a lot of stores yet. But I was able to find many differing types on amazon.com. I even went to the nescafe website to order the peach tea that they offer, since it was not on amazon. They do have a lot of options, but not as much as the K-cup. My husband got me this for Christmas and it is fabulous! The coff taste just as good as the fancy coffee house ones and I can enjoy it anytime of the day and not have to pay a fortune or if I want regular coffee I don't have to make a whole pot.